In our Bonner Training and Enrichment meetings during the school years, we discuss the importance of perspective, relationships, and much more in efforts to inspire one another to improve and intensify the impact that we make on our communities. Recall the Rita Pierson TED Talk video (link at bottom as a refresher :) ) on the vitality of relationships in learning experiences and the ability to succeed. Many more of you will probably remember the meeting led by Jo when he introduced his “fish philosophy." He showed us a video interview of the men working at Pike Place fish market in Seattle. Their shift in attitude from being unhappy with their job of selling fish to their seemingly boundless joy and humor in serving people (flying) fish was an inspiration to many of us. Each day and each task should be approached with the highest optimism and effort. The results from doing so will surprise anyone. Interaction between people runs our planet and it is when those interactions are positive and productive that the results are more astounding and beautiful than imaginable. So, I approach my service in this way and am able to do so by the contagious positivity of my fellow volunteers at IRMC. Each day, even each four hours (regular shifts at IRMC are four hours), I am serving alongside different people. 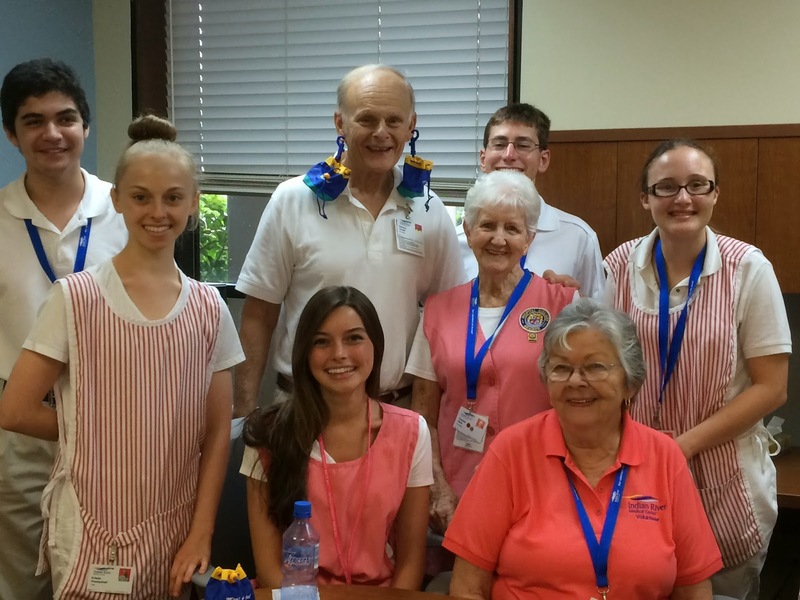 The majority of the volunteers at IRMC are elderly, with several “TAVs,” or teenage volunteers, and even fewer college students in the mix, as well. I learn so much just being in their presence and speaking to them about their families, pasts, careers, current affairs, scientific breakthroughs, FIFA games, America's Got Talent episodes, and whatever else comes up! I share with them my plans for my future and what I’ve learned about current nutrition. We laugh, learn, and enjoy each other's company. Then the phone rings and we're off to discharge a patient or deliver a "super stat" specimen to the lab. That positivity transfers to our interactions with others and creates a welcoming, comforting environment for people who are disheartened about their own, or their loved one's, health. Before last summer, I was not quite sure what serving at a hospital would be like, but it has been because of these relationships that I am able to flourish there and be a better help to others. I actually continue to realize how well relate with the elderly and will carry that on in my service work during the upcoming year. The volunteers and Maureen (the director of volunteer services), especially, have set example of how best to interact with patients, visitors, and staff. We face many different personalities and situations. In addition, each day, things at the hospital are changing. They’ve done a lot of restoration, have constructed additions, and have moved locations of departments within and even nearby the hospital within the past two years. It is still very much so in progress! But each day, we assist one another in adapting to changes. I do the same in helping to train any new volunteers that come to the hospital. I’ve been trying to figure out how exactly to express the thrill I have in volunteering at Indian River Medical Center, so I have given you this reminder of the importance of positive relationships in hopes to spread my story of joy! And I’ve included a photo of me with just a few of the volunteers from this past week! Lastly and on a side note, the data collection project for the Infectious Control Department that I perform with another college volunteer is going well. You know the science-minded: the more data the better! Eventually addressing this issue of below-satisfactory sanitary practices will make a large impact on improving the cross-contamination issue that is a problem in hospitals nationwide. As I mentioned previously, too many infections and illnesses, including MRSA, are transmitted in hospital settings. Being a "germophobe," and for good reason, I take this project seriously and am anxious to see some positive results by the end of the summer! I hope you all are enjoying your service as much as I am!!! Best wishes and B-love. Can't wait to see the results of your research! And that may be one of the cutest hospital pictures to date! They're a goofy bunch, that Thursday afternoon crew! That's not even all of them in the photo! Will be posting some news about the progress of the data collection efforts in the next blog!